192 pages , A4 soft cover, perfect bound with 450+ black and white images. 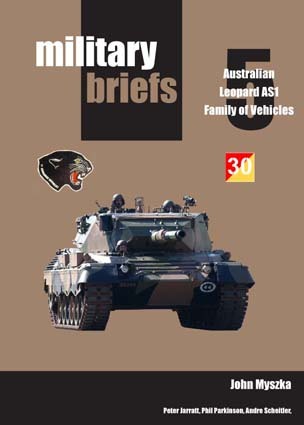 There are also two sets of scale drawings of the 2007 version of the Leopard AS1 in 1/35 and 1/72 scales. There are also ten appendices. The turrets the Australian Army bought for white goods were C1 ex-Canadian Leopard C1, and the hulls were 1A5 hulls ex-German. Both the hulls and turrets were left overs from the deal that secured the Canadians their original C1 hulls matched to 1A5 turrets to make the Canadian C2 – so there were no spare C1 hulls, only the 1A5 hulls from which Canada sourced the 1A5 turrets to make their C2.